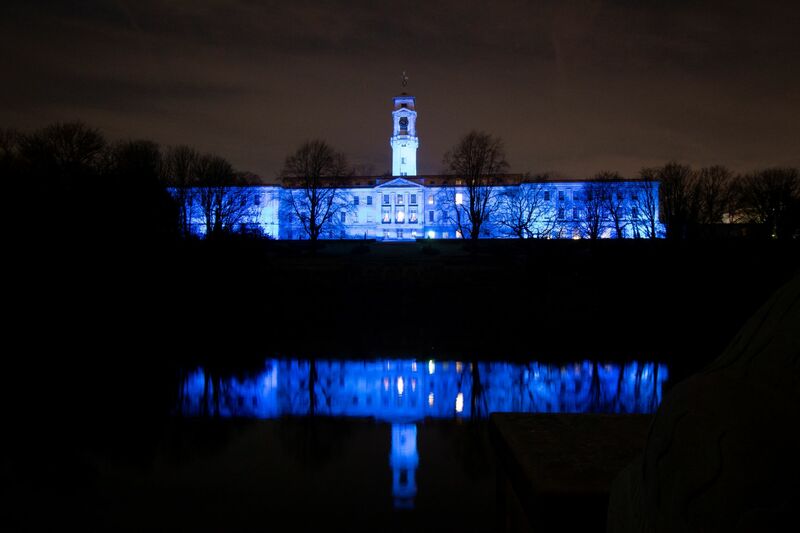 The University of Nottingham’s iconic Trent Building will be lit up in blue on the evening of 22 March – to mark World Water Day. This highlights our commitment to the UN’s Sustainable Development Goal 6: Ensure availability and sustainable management of water and sanitation for all, writes Dr Rachel Gomes of the Faculty of Engineering and head of the interdisciplinary Food, Water, Waste Research Group, which aims to deliver sustainable, resilient solutions to global challenges in the areas of food, water and resource security. The theme of World Water Day 2019 is water for all, leaving no one behind. Water is our global currency. Access to clean water is a human right, but one denied to billions of people. At Nottingham, we are committed to discovering and delivering solutions that address this complex challenge. We have a growing water research network of 125 academics across all five faculties. Through transdisciplinary research, we are bringing together our engineers, scientists, geographers, historians, health experts and many more, to pioneer new ways that ensure every person on our planet has access to the water they need to thrive. Projects from the water research network include exploring the impact of user behaviour on wastewater constituents (Engineering and Mathematical Sciences) and water treatment. Other research projects include water resilience and food security in Ghana (Professor Simon Avery, Life Sciences); and assessment of soils, foods and water around Kilembe copper mine, Western Uganda (Dr Scott Young, Biosciences). In January 2019, the water research network hosted its first internal Water Research Conference, which highlighted our strengths in this area and was attended by 63 academics, from all five faculties. Professor Sarah Metcalfe (Lead for the Developing Sustainable Societies Global Research Theme) provided an overview of the importance of water research; we outlined the University’s current water capabilities and investment in growing the water community; and colleagues from Research and Innovation, including Dr Liz French (Head of Strategy, Policy, Performance and Impact), shared UK and international funding opportunities for water research. The Estates team are marking World Water Day by hosting an Instagram competition. The winner will be announced on Monday 25 March. Water is not just about research. I am proud to work at a University committed to managing the water needs of our institution, our wildlife and our communities. The Estates team is passionate about water and since 2014 we have seen a 17% reduction in water consumption. This has been achieved through projects including rainwater harvesting, leak-reduction schemes and installing low-consumption technologies. On our award-winning Jubilee Campus, water captured from the buildings tops up our lakes, which provide a valuable habitat as well as helping to heat and cool some of our buildings. Our unique estate of 1,341 acres also provides opportunities for water research, such as tests beds for water quality and use on our dairy farm. This includes working with external organisations such as Lindhurst Engineering to use innovative cost effective technology to both recycle waste and recover energy from our dairy farm waste water slurry. ‘Catch the drop’ – please inform estates@nottingham.ac.uk to report water leakages, from leaky taps to large scale leakages. To coincide with World Water Day we’ve published a comprehensive new map showing the locations of water fountains across campus. Visit WasteNott to find out more.